In this industry, I can feel the ripples of excitement. It’s a new year. I’ve been on the phone and emailing shop owners for a few weeks now. Everyone is poised to kick the year off right. It’s the biggest and continually rated the best by the industry. But for some, that’s quite a long trip. Maybe a regional show would make more sense then. After all, these shows are where you get to see the latest equipment, apparel blanks, inks, thread, emulsions, and software that can help you run your decorated apparel business better. You need this stuff to convert orders into dollars. But what if you did something different this year? Instead of looking to acquire products, you went after ideas. New ideas are harder to grab. They float around. They aren’t a tangible thing you can put into a box, either. But in the right context, that doesn’t mean you couldn’t pick a few up and take them home! This year, there is something different cooking in the decorated apparel industry. Every single thought leader is gabbing about it. In fact, I haven’t seen this much excitement about an event in a long time. It is powered and backed by SGIA. Yeah, I know…their trade show rocks as well. But let’s not lose focus. 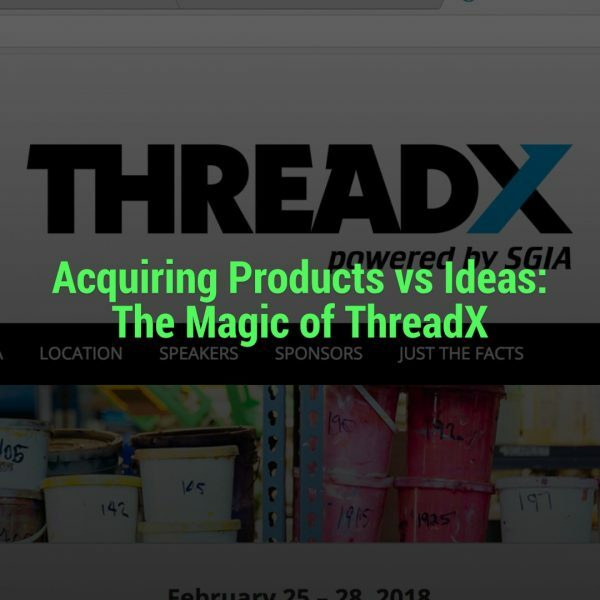 ThreadX is an event solely driven to explore and hand deliver new ideas that you can take back and possibly change the course of your business. You aren’t going to get that with a badge scan on the trade show floor. This event will take a high-level exploration of e-commerce, consumer trends, branding and potential shifts in the marketplace. The rocket fuel that is driving this is their speaker line-up. Mark Coudray kicks everything off with a never-before-heard talk on “Transition Strategies for Success in the New Economy”. I’m part of his Catalyst Accelerator group and I get to listen to him once a week. He was absolutely incredible with last year’s InkSoft MaxProfit event. Then Steve Weiss with MuteSix will jump into “How to Run Profitable and Scalable eCommerce Facebook Ad Campaigns”. Do you think you are marketing your shop correctly on Facebook? My guess the answer is “not really”. Come learn how to do it better! Chris Simpson and Robert Prioleau with Blue Ion are paired up to deliver “Getting Found Online: How to Succeed in Google, Facebook, and Amazon’s World”. Perfect. I just bought a book on Google Analytics. This ought to go nicely with that. Thinking about your own line of apparel? 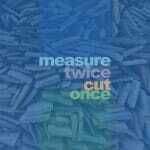 Brandon Barber from Vapor Apparel will chat about “What to Know Before You Go: Cut and Sew”. Awesome! What if you were a completely vertical shop? What would that take? Learn how! Then riCardo Crespo with Th13teen will deliver a “Marketing Workshop”. Tons of shops need help with this. You know you do too. A good number of shops in this industry have anemic marketing programs and struggle. Learn how to do it right in this workshop! That’s Just The First Day! It gets better with the second! Check it out! Tim Williams from YR Store kicks everything off on the second day by talking about the “Omnichannel Consumer Experience”. Do you even know what this means? Here’s a clue – an omnichannel experience is a multi-channel approach to marketing, selling, and serving customers. Think about the way that you can create an integrated and cohesive customer experience regardless of how the customer interacts with your shop. That’s right. Put the customer first, folks. Next up, Mike Niemczyk from SapientRazorfish will expound on the virtues of “The Importance of Making Mistakes on Social”. Good. I’m happy to make a ton of mistakes. But wouldn’t it be better to learn what to do when you make them? Let’s find out. Then Rob Kramer and Andy-Louis Charles will talk about “Co-opetition in the Garment Decoration Industry”. What? A talk from the guys at Custom Ink? What do you think you could learn from them? I can’t wait! That’s followed by Ryan Moor with Ryonet and Allmade fame, discussing “Changing Commodity to Value”. I’ve heard Ryan talk on several occasions and he delivers the goods. That’s a pun. By the way, how’s your “Value Proposition” for your shop coming along? Maybe you should hear this. Mel Lay with SandiLake Clothing will talk about her experiences with her talk on “Creatively Navigating Shirts and Sharks”. Have you been on Shark Tank? Mel has. I’ll bet she has something to teach you not only about that experience, but how she incorporated those lessons into her own business. Lastly, the famed Johnny Earle will talk about his company, “Johnny Cupcakes”. This might be my favorite part of the event. I’m glad they saved the best for last. So that’s a lot of info to absorb. But that’s not the half of it. Your face is pressed up against the frozen glass looking into a room. That room is filled with the 135 people that went to ThreadX. Boy, do they look happy. Not only did they hear all of these speakers. But they made friends. They networked. Each of them picked up a few ideas and tucked them away into their pockets. These are the ideas that are going to transform their businesses later this year. They are going to change something, improve something, or develop something. That something will kick in and you’ll wonder how they did it. They aren’t going to tell you. Unless of course, you happen to know them. It all started with these lucky few scribbling down some notes as they heard that idea that would transform their business. Don’t be left standing in the cold, an outsider looking in! Grab one of the remaining seats at ThreadX. They are only selling 135. That’s about an airplane full of people. But there is less available now than yesterday. Because I already bought my ticket. I want my pockets stuffed with new ideas. Crammed full actually. Click Here to get your ticket to be an insider at ThreadX. Don’t be left standing there in the snow with empty pockets.